Is Tiger Woods Courting the Yips? In attempting to improve his ballstriking off the tee, Tiger Woods may be laying the groundwork for developing the yips! Centrifugal force is a fact of life for golfers. The driver pulls away from you with 100 lbs. of centrifugal force at impact. That’s the same amount of force that you experience when you try to lift a 100 lb. sack of cement. Of course, this amount of force only lasts for a fraction of a second, so you may not notice how strong it is. But you do have to compensate for it during your swing. Most golfers ‘go ballistic’. That is, they let the 100 lbs. of centrifugal force extend their arms and club into a straight line at impact. After all, why argue with Mother Nature and the Laws of Physics? Because the hands are dropped at address, but extended at impact, this centrifugal pull extends the distance between your club head and your shoulders by 6-7 inches. If you don’t move your shoulders 6-7 inches away from the ball during your downswing, your club head will be buried 6-7 inches underground (if your club shaft doesn’t break first). Golfers move their shoulders away from the ball during their downswing by ‘standing up’, or decreasing their spine angle, as seen down the line. Your spine angle is how many degrees you tilt your upper body forward from vertical at address, as seen from down the line. For most golfers, that’s 25-30 degrees with their driver. At impact, by contrast, most golfers have a spine angle of only 10-15 degrees. This necessary change of spine angle during the downswing, when you ‘go ballistic’, is what forces golfers to spend endless hours at the driving range. Think about it. You have to stand up exactly the right number of degrees for every swing speed. Higher swing speeds mean more centrifugal force and more distance between your shoulders and club head. Conversely, lower swing speeds mean less centrifugal force, less distance, and less ‘standing up’ to make good ball contact. There are other factors to consider as well. Some of the extension of the arms is determined by the tension in your shoulder muscles. Some days you are relaxed, your muscles stretch more easily, and you have greater extension at impact. Other days you may be tense, so there is less stretching, less extension. 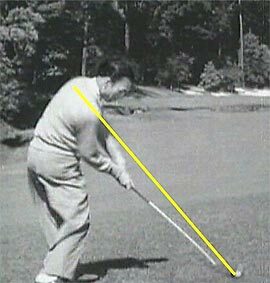 Your brain, of course, has to make this fine adjustment of your spine angle in less than a second while you are holding onto a club that is speeding away from you at 100+ miles an hour, and pulling on your body with 100+ lbs. of force. This is a lot of responsibility for a few pounds of gray matter. It requires endless practice on the driving range. Some well-known golfers came up with what they thought was a better solution. Don’t let the arms and club extend. That’s right. Don’t go with the force. Don’t let the (centrifugal) force be with you. Fight it every step of the way. Here's how they did it. They contracted their forearm muscles so tightly that they didn't allow any extension to take place. They gripped so hard with their forearm muscles that they returned their club to the same position at impact that it had at address, in spite of the fact that centrifugal force was trying to pull the club away from them. There is one thing we should clear up right now. There is no such thing as the ‘club plane’. This is a mistaken idea. 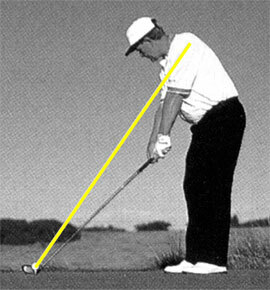 There is only one swing plane, which is a plane extending from a line drawn from your shoulders to the ball. Your hands and club may be on or off this plane during your swing. But there is no ‘club plane’. A line drawn through the club shaft at address is simply the club shaft angle. It's not a ‘plane’ at all. If you want, you can ‘say’ there is a plane, but the club shaft is only on this ‘plane’ at impact. It would be physically impossible to keep your club shaft on this ‘club plane’ at any point other than impact, whereas it is not only possible but advisable to keep your club on your swing plane as long as possible. Returning your club to the exact same position at impact that it had at address seems like a brilliant maneuver. You don’t need to change your spine angle very much (except to compensate for stretching of the muscles in the upper back which are stabilizing your shoulders), so there is less guesswork. You can (theoretically) increase your chances of making good ball contact. Indeed, this solution to centrifugal force, which we call the ‘gripper’ solution, was used by some of the best ball strikers of all times. Sam Snead, who won more PGA titles than any other golfer, was a gripper. Here is Snead at address and impact from down the line. Snead is using his biceps and brachialis muscles to keep his right elbow from extending at impact, which enables him to keep his club close to the position it was at address and keep a fairly constant spine angle. In other words, by contracting the muscles of his arm and forearm, he prevents centrifugal force from straightening his arm and club. Shown below is another well-known and successful golfer at address and impact. Ben Hogan was also a gripper. Hogan is acknowledged by many to have been the best ball-striker of all time. Here you can see Hogan using the muscles of his right arm and forearm to prevent centrifugal force from straightening out his arms and club at impact. If he did allow this, his hands would be on or near his swing plane at impact. Lee Trevino, another gripper, was also a very respected ball-striker. Trevino won the Vardon trophy for lowest scoring average in 1970, 1971, 1972, 1974, and 1980. He won 29 tournaments on both the PGA and senior tours. The pictures below show Trevino from up the line. Look at the muscles of his left forearm and you can see how violently he is contracting them to overcome 100 lbs. of centrifugal force. You can also see that his club at impact is almost exactly at the same position it was at address. Quite an accomplishment! Finally, here is Tiger Woods at the 2007 Augusta Masters Tournament. Unlike Snead and Hogan, Tiger is resisting the 100 lb. pull of centrifugal force with just his forearms; he is not bending his elbows at all. In this, he is more like Trevino. He is keeping his wrist angle (the angle between his forearm and club shaft) at impact at 25 degrees, just 5 degrees less than what is was at address. As a result, he only has to reduce his spine angle by one degree! Opposing centrifugal force seems like the perfect solution to better ballstriking. Don’t let the force pull your club head away from you. Keep your spine angle as constant as possible. Improve your ability to contact the ball with the center of your clubface. Fighting centrifugal force reminds us of the apparent good sense of opposing another force of nature — a raging river. Just dam the river, and thereby prevent alternate yearly floods and drought. But just as damming up a river can have unintended consequences (accumulation of silt that increases erosion downstream), so does over-gripping your driver or wood. If you know your golf history, you know that Snead, Hogan and Trevino had more in common than their winning ways. They all developed the yips. How can over-gripping your driver and woods have anything to do with yipping your putter? The answer lies in the muscles and connective tissue in the forearm. Even if you lift weights, the muscles of the forearms are not very big. They simply were not designed to oppose 100 lbs. of force hundreds of times every day (on the practice range) for decades on end. They were designed for fine motor movement. When you overload muscles, you actually tear some of the tens of thousands of small, individual fibers that make up those muscles. When you tear muscles, part of the healing process is microfibrosis, the formation of scar tissue in and around those torn fibers, and even around the muscles themselves. This microfibrosis immobilizes the area to help it heal. It's nature’s internal cast. We often experience this tearing as delayed soreness. In some cases individuals don’t notice this soreness, and are completely unaware that they are tearing the muscle fibers in their forearms. Unfortunately, once the muscle fibers have healed, the microfibrosis does not go away. Once started, microfibrosis accumulates over time, making golfers stiffer as they get older. By the way, you don’t have to take our word that overusing muscles tears muscle fibers. Just enter ‘lifting weights muscle fiber tear’ into www.google.com and you will find many articles about it. To prevent centrifugal force from straightening out your arms and club at impact, you have to strenuously tense and contract your forearm muscles. These same tense, bound up muscles are then asked to very lightly grip a putter and guide it carefully and precisely on its path, to produce just the right distance and direction for a successful putt. These bound up, tense muscles just can’t grip the putter lightly and they revolt by going into spasm, or ‘yipping’. 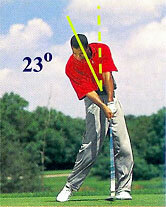 Tiger Woods didn’t always fight centrifugal force. In the past, he elected to go with the force, as you can see here. He played pretty well this way, winning the 1997 Masters by 12 strokes, and the 2000 Open by 15 strokes. Another good player who went ‘ballistic’ was Jack Nicklaus. Jack is the only golfer with a triple career slam — winning all four majors three times. You can see in the photos below that he let the force be with him, allowing it to extend his arms and club so that his hands moved from well below his swing plane at address to almost on his swing plane at impact. Jack never got the yips, even after decades of playing golf at the highest level. Of course, both Tiger and Jack had to change their spine angle in order to compensate for the increased distance between their shoulders and club head. They were still able to strike the ball well because of their great hand-eye co-ordination. But not everyone is so blessed. Is it Worth Fighting Mother Nature? Is it worth getting the yips later in life in order to improve your ball striking? Hogan and Snead didn’t think so. They both complained bitterly about getting them. We have not seen any love letters to the yips. Everyone who has ever had them has expressed only displeasure, frustration and despair. Is Tiger Woods Correcting the Wrong Problem? Despite changing from 'ballistic' to gripper, Tiger continues to push his ball to the right off the tee. Did he correct the wrong spine angle? We see that he pushes the ball to the right because of his change in spine angle from the front, not from his change in spine angle down the line. Tiger has progressively increased his front impact spine angle over the years, from 23 degrees to 29 degrees, a 26% increase. When you tilt your upper body to your right, you open up your clubface. You can verify this at home by holding your driver at address and tilting your upper body to your right. You will see your clubface open. As we all know, an open clubface pushes the ball to the right. The right rough is where Tiger’s misses go off the tee. Tiger’s increase in front spine angle first came from his shifting his hips to his left, as you can see in the second photo above. Notice that in the first photo, his left hip is inside his left heel, exactly where it should be. Later, Tiger increased his front spine angle by overusing his right obliques, the thin muscles that form the sides of the abdomen. Here is a picture of them. The obliques are the muscles in red. As we said, these muscles are paper-thin. They were designed to stabilize the trunk. They were not designed to pull the driver down at 100 miles an hour. But this is what Tiger Woods is doing. 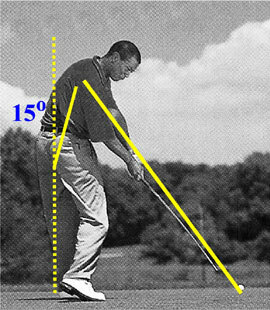 He reduced the use of his hips (perhaps thinking, erroneously, that they were ‘outracing’ his arms) and now must rely on his paper-thin oblique muscles to maintain his club head speed. 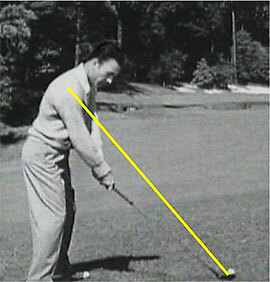 Unfortunately, when you power the club on your downswing with your obliques, you also increase your front spine angle. As these muscles contract, they not only pull your trunk down, but also tilt it to your right. With all due respect to Tiger Woods, we feel he is not only correcting the wrong problem (change in spine angle down the line), he is ignoring the real problem (change in spine angle from the front). In addition, he is courting the yips by over-gripping his driver and woods. 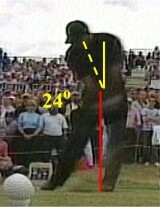 As an admirer of Hogan, Tiger may think if he imitates Hogan’s swing, he will share in his prowess at ballstriking. But Hogan ended up with the yips because of the way he used his driver. The problem inherent in copying human golfers is that you copy their faults as well as their successes. There is a ballstriker far better than Hogan, Snead, Trevino and the golfers who ended up with the yips because they fought centrifugal force. That golfer is not human. It's a ball-striking robot. It hits 280-yard drives into a 10-yard circle all day long. It does not do this because it's a machine. It is accurate because of the way it was designed. It was designed with constant spine angles and one swing plane. 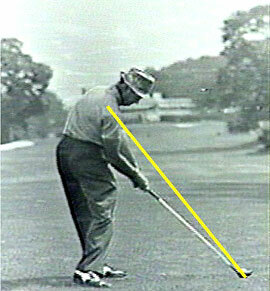 The spine angles from the front and down the line never change during the entire swing. The arm and club are always on the same plane. It was designed this way because it's the simplest design that gets the job done: to hit the ball where you want it to go. As engineers, the designers were also aware of centrifugal force. Having the arm and club always on plane is the most effective way to handle that force. Human golfers can do this. You can keep your spine angle down the line constant, and ‘go ballistic’, just by putting your hands on your swing plane at address. Golfers think they drop their hands to relax, but there is no evidence that it does actually relax anyone. Do you feel more relaxed on the first tee because your hands are dropped? No. Dropping your hands at address is just a convention. But it is a convention with hidden costs: endless practice and poor ball contact. There are great dividends from placing your hands on your swing plane at address. You can go ballistic on your downswing and really improve your ballstriking because your club will be in exactly the same position at address and impact. A One Plane, One Axis Swing? We can't find photos of past golfers with a truly efficient yip-free, one plane, one axis swing. Purely by convention, they dropped their hands at address, as do golfers today. What about tomorrow? Will future golfers be willing to give up convention to improve their ballstriking? Will they be willing to tread new ground, rather than follow the path of well-known gripper-yippers? They might. Our golfers do. Notice that this golfer’s arms and club are on his swing plane at address and impact. In fact, they are on plane during his entire swing. At 5’10” and 150 lbs., his average drive has lengthened from 275 to 290 while his accuracy improved. This shows that by being on plane with a single axis, you can increase lengthand accuracy at the same time. You can maintain your front spine angle by using the rotation of your hips to power your club, instead of using your obliques. 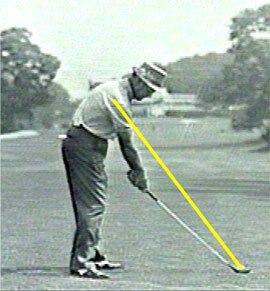 This means giving up shifting your hips to your left, a move popularized by Hogan. 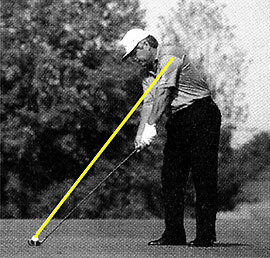 Shifting his hips to his left, to start his downswing, worked well for Hogan, who suffered from a snap hook. 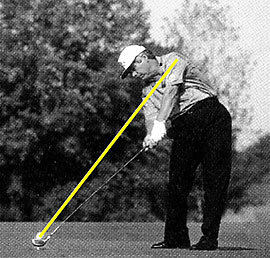 By shifting his hips he increased his front spine angle, opened his clubface, and thereby prevented hooking the ball. But for the vast majority of golfers, who don’t have a left hook, it means your drive goes to the right. You can compensate with your hands at the last 1/30th of a second by squaring up your clubface, but it’s a gamble. Sometimes you square up just right, and the ball goes straight. Sometimes you overdo it and the ball goes left. Sometimes it’s not enough, and the ball goes right. Left, right, left, right — or what's known as ‘army golf’. Golfers are mystified by these errant drives, never suspecting that they result from shifting the hips to start their downswing. If you don’t start with a shift to the left, how should you start your hip rotation? By moving your left knee to your left, a move used by Bobby Jones, Byron Nelson, Sam Snead, Jack Nicklaus, Arnold Palmer, and today, by Jim Furyk (ranked #2 in the world in 2006). Not bad company to be in. The Efficient Golfer. We have also created our Power Hip Trainer to increase the strength and speed of your hip rotation. 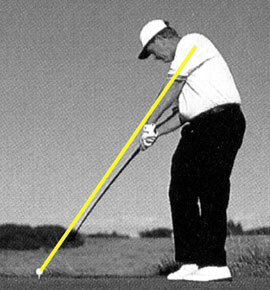 Here is what a stable front spine angle looks like at address and impact. By keeping his spine angle and front spine angle constant, our golfer was able to improve his accuracy as he increased his average distance from 275 to 290 yards. Getting better in golf means more than lifting weights and getting in shape. It means that you look at the conventions of golf and question every one of them. If you want to be as good as everyone else, do what they do. If you want to be better, do something different.